John Strachan, bishop of Brechin 1788-1808, was born at Redford, Garvock ca. 1719. For the full range of maps of Garvock, see National Library's Maps. 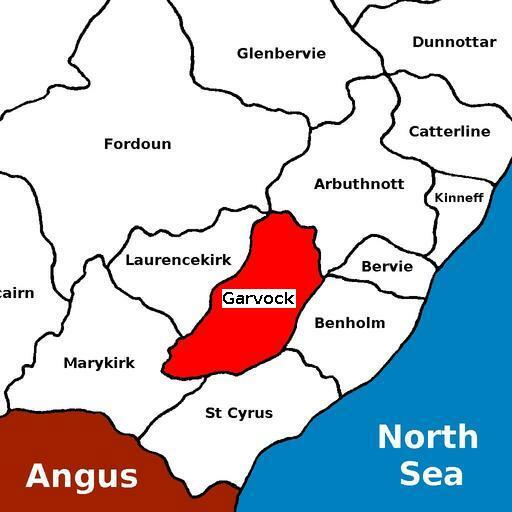 See Geograph.org: Garvock - recent photographs of Garvock. National Grid ref. NO7470. Andrew Jervise recorded some monuments at Garvock in his "Epitaphs & Inscriptions", vol. 2, pp. 318-22. See Scottish War Memorials Project: Garvock, WW1 for photographs and details. Burial records for Garvock are held by the Registrar in Stonehaven. See Kincardine and Mearns Burial Grounds. It includes a plan of the kirkyard, 1882; an index of lair owners; and a list of burials, 11 Sep 1882 to 14 May 1929. David A. Pearson - Johnston, etc. Garvock was in the Commissariot of St Andrews. There are no records for Garvock.